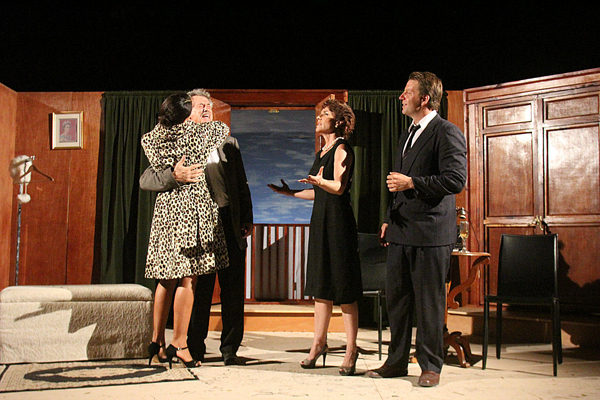 Don Savage and Terry Blumes shield Denisse Lashley, who is barely clothed under the mink coat, from the office secretary in The Nosara Players production of Not Now Darling. A record 150 people attended the 14th annual fundraising evening for the Biblioteca David Kitson, raising a total of $8,000 for the community library of Nosara. “That is our highest amount ever,” said Beverly Kitson, Library Director, who was instrumental in founding the library in 1996. The annual event raises about one third of the library ‘s total annual operating budget. 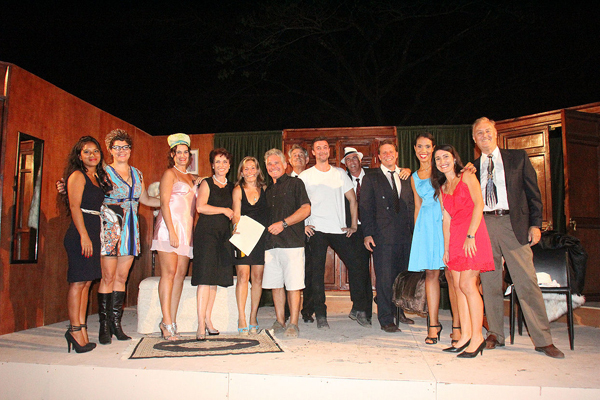 Four years ago, the fundraising event committee added a play to the reception and dinner to entertain the donors. The Nosara Players, a local group of theatre fans, formed to prepare shows for the event. For the first time, the dinner and play were held on two nights and were able to bring a significantly higher number to the audience. 116 attended the single dinner and show last year. 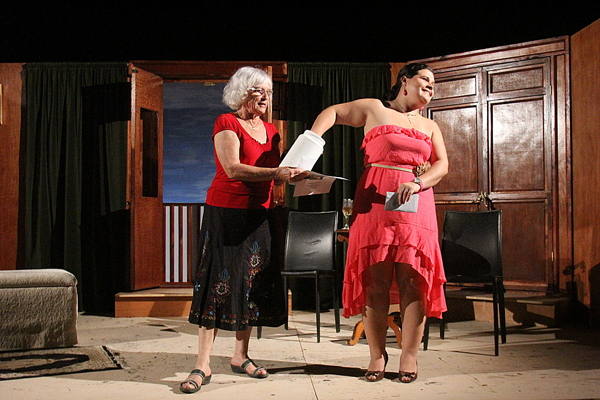 Denisse Lashley pretends to be Don Savage's girlfriend so that Carolyn Prowse Fainmel won't discover she is actually the mistress of Terry Blumes, who plays her husband, in the Nosara Players production of Not Now Darling. 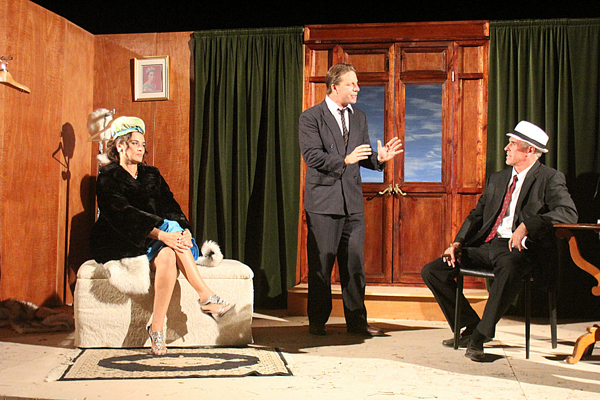 “Not Now, Darling”, a British farce set in the 1960’s, was the show this year. 11 locals performed in the comedy, after practicing together for the past 2 ½ months, at least two hours a day. Directed by Carolyn Prowse Fainmel, the show starred Don Savage and Terry Blumes as proprieters of a London fur salon. The action centers around a mink coat which several men want to give to their wives or mistresses. This leads to a comedy of errors, mistaken identities and misplaced clothes. Savage and Blumes each had over 650 lines in the play. Savage has been in every one of the previous Nosara Players shows but many of the actors were new to acting altogether. Mark Fainmel constructed a professional set that “looked like something in New York,” said Kitson. Participating in smaller roles were Kim Shook, Donald Spears, Daniel Brett and Lisseth Ricardson. “It was hilarious when the one girl in the closet came out wearing dish towels like a bikini”, said Patsy Northcutt, a visitor from California. “It was great. So very funny,” said Christina Trafton of Ostional, about the performance. Kitson, and her friend Bobbie Cook from New York, watched the show several times as Kitson oversaw the dinner event and attended a dress rehearsal. “There are lines and scenes we are still laughing and talking about,” she said. The play was performed on February 27 and 28 at Del Mar Academy in their open air theatre. 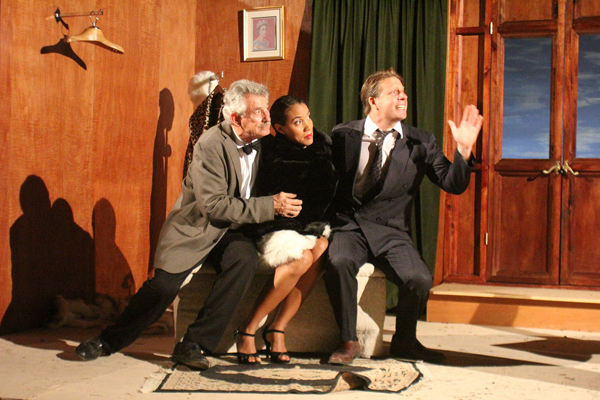 Raechelle Sexton, secretary to Steve Reyer's character, wants the mink coat that Terry Blumes' character has promised to another woman in The Nosara Players production of Not Now Darling. Since its inception, the Kitson Library has served thousands in the Nosara community with English instruction, computer classes, literacy support, after school and evening homework help, senior services and book clubs. The library maintains a collection of over 14,000 books and a computer center with 10 internet connected and networked computers. During 2012, the library had 13,284 individual visits from community members and visitors to Nosara. Each year at least 50 local Nosara residents graduate from the intensive English instruction course the library provides. 2012 was a record year with 88 Ticos earning a certificate of completion. Beverley Kitson holds the raffle drawing during intermission of the performance of Not Now Darling at the library fundraiser. The entire cast and crew of Not Now Darling pose after the closing night show the Nosara Players performed at the Kitson Library fundraising dinner. The flor de itabo or izote shrub is a favorite ingredient during Easter time since it is characterized by appearing in the months of March and April. This edible flower is one of the few flowers present in Costa Rican kitchens. “Taste of Nosara” showed the depth of culinary talent as chefs from local restaurants competed for bragging rights and raised a much-needed $1565 for the fire-fighting and security association. There are still some endings ahead, but if we have been doing our work throughout the month, these last few adjustments should be relatively easy to manage. Nosara’s first ever Taste of Nosara, offering community members samples of favorite items from local restaurants, will feature a range of dishes from the typical to the exotic this Sunday the 24th. If you crave sushi, now you can just get on Facebook to order it and have it delivered to your home. In February, Luis Protti began Torito Sushi delivery service in Nosara and Guiones. At least 15 local restaurants will participate in the first ever Taste of Nosara on Sunday, March 24th to raise funds for the Nosara Security Association (NSA), an organization that supports Nosara firefighters, police and volunteer security forces. The second round of Samara Fiestas will take place from Thursday, March 21 to Monday, March 25, organized by Dr. Fulvio Paniagua Acuña to raise money for the EBAIS Clinic located in Cangrejal of Samara. Although Sol y Mar Restaurant and Cabins looks the same, you may notice some changes as Yolanda Bosch Anduig and David Montserrat, a French-Spanish couple, have taken over management. Mercury stations direct on the 17th, ushering in some surprises and about faces, with a bit of chaos thrown in the mix. With St. Patrick’s Day soon approaching, some of the local spots more known for their evening entertainment are gearing up to celebrate the popular holiday. After 7 years in business, Nosara native Alexander “Chandy” Cabalceta Lopez decided it was time to stop renting and build his own locale for his popular pizzeria, Il Basilico. All breaths held, everyone stood up in the arena before he came out. The ones inside the ring were ready with their cameras and cellphones to record this terrifying moment that all were about to experience. He was the ninth in the lineup and the bull ride narrator had built up the tension for 15 minutes. The new moon in Pisces arrives on the 11th, shining the spotlight on unacknowledged issues that are still tugging at your subconscious. As March begins we are treading water, in the midst of potent Mercury retrograde. Feelings are running high, and the way forward is murky.